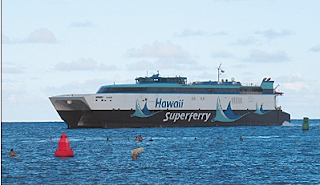 I am so pissed about how Hawaiians are reacting to the Superferry. It's not enough that they WAITED until the damn thing started carrying passengers between the islands. It is the fact that they are all up in arms, blockading, saying things like "be nice now, you on Maui - MY home" to people getting off the ferry ( people who are most likely FROM THE ISLANDS TOO...like folks who do understand the meaning not only of 'aina, but of ka'ama'aina) and not allowing the ferry to dock. The argument being that they think invasive species (from another island within the chain? IS that even possible?) will come in the water the boat brings...And more cars and more people on Maui and Kauai. Uh, it is a water propelled catamaran. That means it exchanges water as it goes right? NO bilgewater is going to be released like in ALL THE BARGES THAT CARRY GOODS TO ALL THE HAWAIIAN ISLANDS!!!!! It is water from maybe a hundred feet previous? I dont know the exact schematics of a water propelled boat, but I am just thinkin...Maybe I can understand the anger about all the additional cars on Maui and Kauai, but wouldn't those cars be rented by the visitors anyway? It is not like Hawaiians are going to give up their cars anytime soon. Isnt the rate there something like ONE CAR A PERSON!!!!??? And by Hawaiian I mean people living there, not the bloodlines.... I don't know. It is jsut so sad going back there and seeing Walmart and how many people are buying into all the mainland chains. One can't get fresh milk on Oahu. It is barged in. There is nothing isalnd like left. Even on Maui. So maybe the folks on Kauai have more of edge to their anger - they have managed to keep the onslaught on mainland USA away better than some of the other isands. I think ultimately I am just so confounded. I think the Superferry is a better travel resource than flying. Less pollution. Gotta be a fact. I will wait to see the results on the Enviornmental Impact Survey for that. If I don't see people getting all up in arms about the onslaught of barges that arrive in Hawaii everyday, in the same manner as these folks are about the Superferry, than I will file this under : another lame thing about the beautiful islands and some of the mindset that makes Hawaii the place it is. I want to know what all the Hawaiian Sovereignty people and the UH Hawaiian studies people have to say. And who is the judge on Maui that blocked the ferry from docking there. That is so sad. As an ousider who is a northwesterner the Superferry seems like a good idea to me like you said better than flying. And here is my car theory just like yours. If you don't ferry your car over aren't you renting one anyway? So either way yes there will still be the same car emissions right? And if people are worried about pollution don't have 3 cars per household! Carpool use public transit! Oh yes and puppies cure everything. Seriously I want to take her to a cancer ward and win a nobel prize. Actually I burnt my pinky finger making coffee today I am going to lay the puppy on it. I think they are worried about snakes. There aren't any on Kauai. So do they just have the Superferry going to all of the other islands except Kauai? all of your arguments are valid. it doesn't make sense either that there are demonstrations this late in the game. everyone's had time to protest yet in true island fashion, it happens at the last minute. the thing that makes me question their reasoning to demonstrate is how is that it's ok for the big cruiseboats and matson ships which bring a good portion of items (including that monster truck with the kau inoa sticker on the back that they have to drive) to dock but it's not ok for a ferry which has passed all epa and government guidelines to dock. a ferry that is bringing loved ones who maybe can't afford an air ticket (back when it was $79 o/w). the logic of us islanders is beyond me. miss you lots! give xoxoxo to oscar. say hi to c.
I asked some people o maui about this b/c i too, felt confused. The person i talked to said that the super ferry would go thruogh an area where whales are frequently seen, and b/c the ferry is traveling so fast, collisons are inevitable. I don't know if its true or not, but i was excited about the superferry, too.